Where’s the pace in the race? 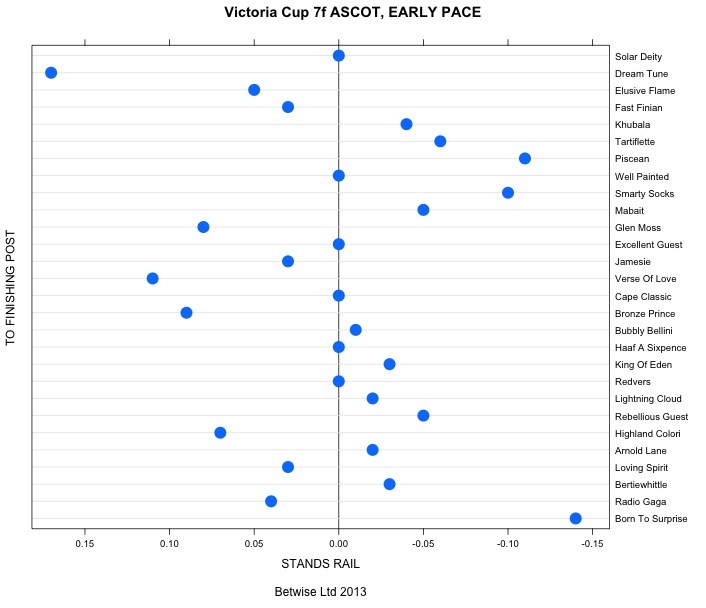 Ascot and York are two courses where being drawn with the pace is often more important than the draw per se – meaning it is important to be drawn with the pace rather than on a particular part of the track. True, there can be marginal biases at 7 and 8 furlongs at York and Ascot (for example a negative in large fields where high drawn runners can be forced wide, as around the turn at York), but pace is always important over the straight courses. In the 6 furlong Group 3 race at Ascot (3:05), for example, although the first two in the market (with Redford a very warm order drawn 16, and Genki as second favourite drawn 17), the leader and lagger stats suggest that the early pace in the race is towards the stands side, with Taajub, in stall 2 expected to be prominent early. Bewitched and Doncaster Rover may benefit most from his early tow. Today’s leader and lagger statistics for all today’s races under one mile are now up in the Betwise Members’ Area. 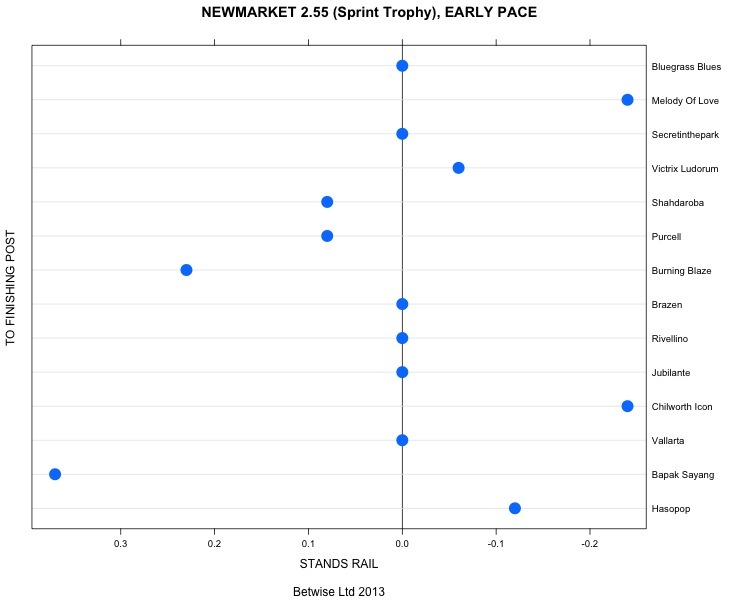 Looking down the card at Newmarket, it’s notable how many of the early pace runners are drawn high today. In the 2.25, State Opera and Fury are drawn 26 and 24, respectively. With a large number of runners, being drawn with the pace can be hugely important – moreover, with the stalls being on the far side today, high drawn runners also have the assistance of the rail. So, whilst drawing a line under anything drawn less than 20 here may be a radical strategy, it is useful to narrow the field. The same comment applies to the Cambridgeshire, and even though this is a 9 furlong race, the sheer number of runners across the track means that being drawn with the pace is hugely important. Assuming there is no intrinsic track bias elsewhere, the best strategy again may be to draw a line under anything coming out of a draw under 20 – which would, in this case, eliminate the market leader.